Learn more about building and construction codes for tiny homes. The tiny home trend is taking Albuquerque by storm as an option for affordable and sustainable living. But before you take steps to build your itty-bitty abode, it's important to know that there are certain building codes and regulations that you need to follow to ensure safety and that you're in compliance with the law. The Planning Department's Building Safety Division has put together some informative guidelines for anyone considering constructing a tiny home. 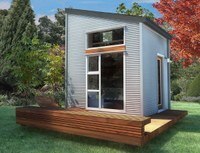 These guidelines will help ensure you build a tiny home that's affordable, sustainable and up to code.